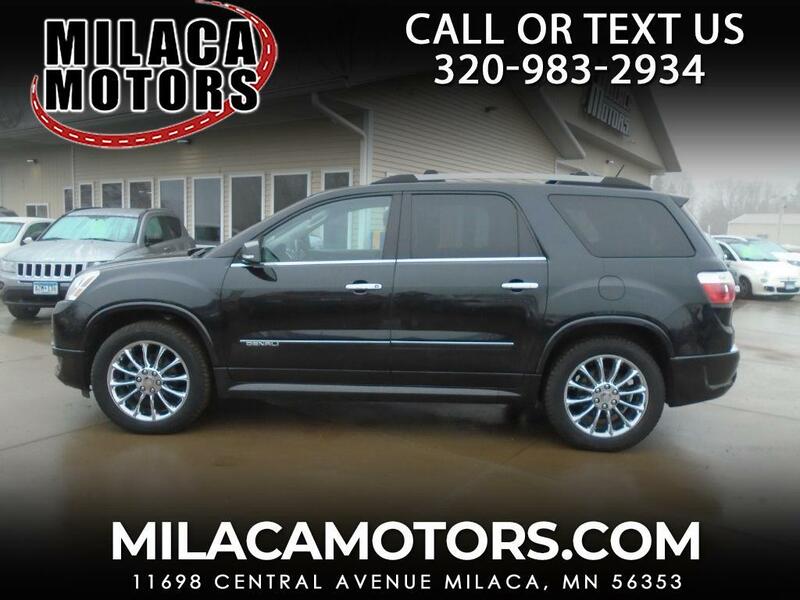 Our 2012 GMC Acadia Denali AWD with Navigation is shown off in a breath-taking Carbon Black Metallic. Powered by a proven 3.6 Liter V6 that produces 288hp while connected to a 6 Speed Automatic transmission for smooth shifting and passing authority. This All Wheel Drive SUV allows our large crossover to handle beautifully on the open road. You will also find great-looking alloy wheels and fog lamps. Take a look inside the Denali cabin to find amenities and accommodations for every trip. Open the huge panoramic sunroof, and sink into heated/ventilated front seats. Enjoy increased sound dampening to enjoy the premium ten-speaker Bose sound system with CD and auxiliary input. Rest assured your passengers will be content with comfortable third-row seating and a DVD entertainment system. Let navigation keep you on course as you ride in style! Safety is fundamental with GMC, as shown by advanced safety features like StabiliTrak, surrounding airbags, and more. Give your family the security, performance, and comfort that only come from owning an Acadia Denali. Print this page and call us Now... We Know You Will Enjoy Your Test Drive Towards Ownership!